We regret to inform that due to winter storm currently hitting the East Coast, more than 710 flights had been canceled and more than 4700 delayed to and from USA. According to reports, around 60% of the entire day’s schedule had already been grounded at Newark and close to the same percentage at LaGuardia. Between20% and 45% of the day’s flights were canceled at JFK, Washington Reagan, Boston, Washington Dullesand BWI. Winter Storm Toby, the fourth Nor’easter in less than three weeks, is set to wallop the storm-ravaged East Coast with a fresh blanket of snow just in time for the first day of spring. 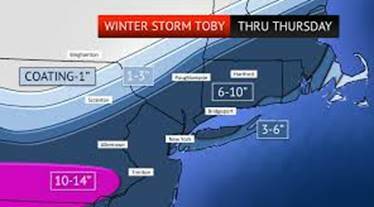 The good news is Winter Storm Toby is not expected to be as powerful as previous Nor’easters earlier this month, according to The Weather Channel. But it still could bring more than a foot of snow to various major cities along the East Coast like New York City. As of Tuesday afternoon, Winter Storm Toby was already wreaking havoc on the south — bringing hail, heavy winds and tornado warnings to Florida and Georgia. It will make its way up the East Coast Tuesday night, with the brunt of Winter Storm Toby happening during the day Wednesday.